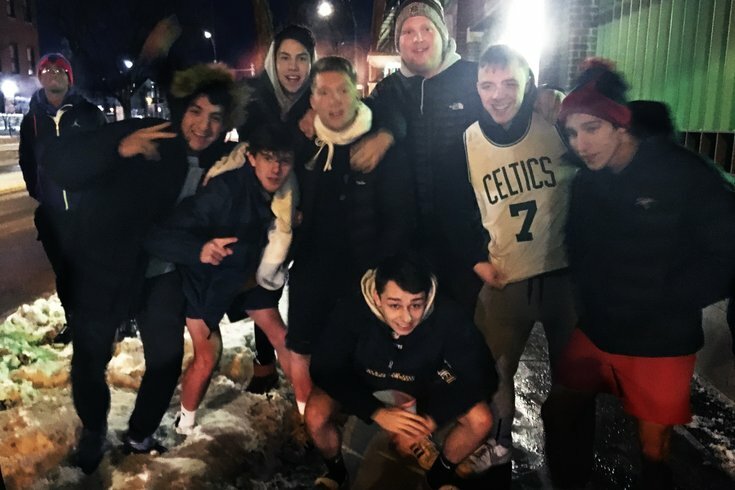 DePaul University students, some in nothing more than light jackets and basketball shorts, huddle on a Chicago street as they wait for a bus to take them to a game against Villanova Wednesday night. 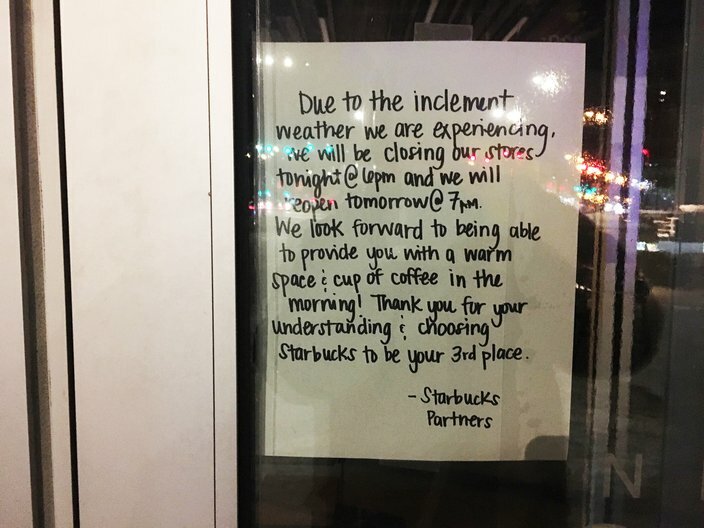 The temperature: 15 degrees below zero with a windchill of 35 degrees below at O'Hare Airport. "You call this cold?" one student asked. 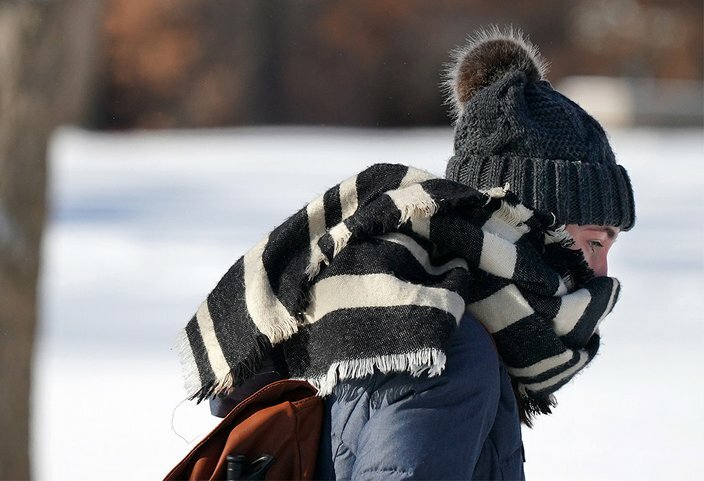 Record-breaking cold seized the Midwest this week as a split polar vortex resulted in one of the coldest air masses in recorded history. 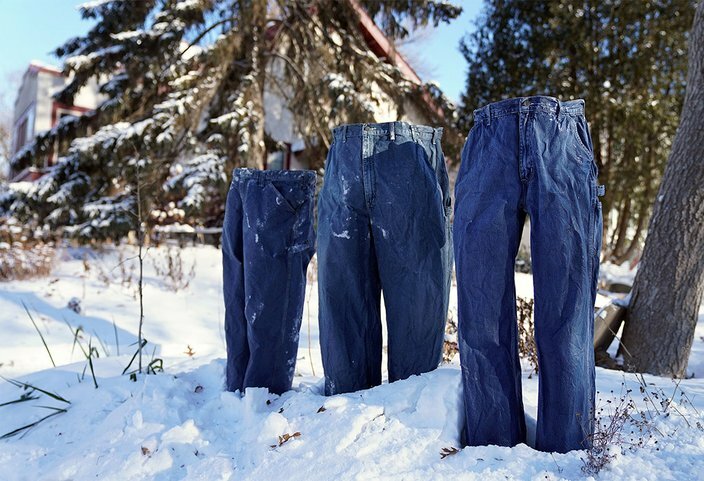 Fargo, North Dakota reported 31 degrees below Fahrenheit on Wednesday. 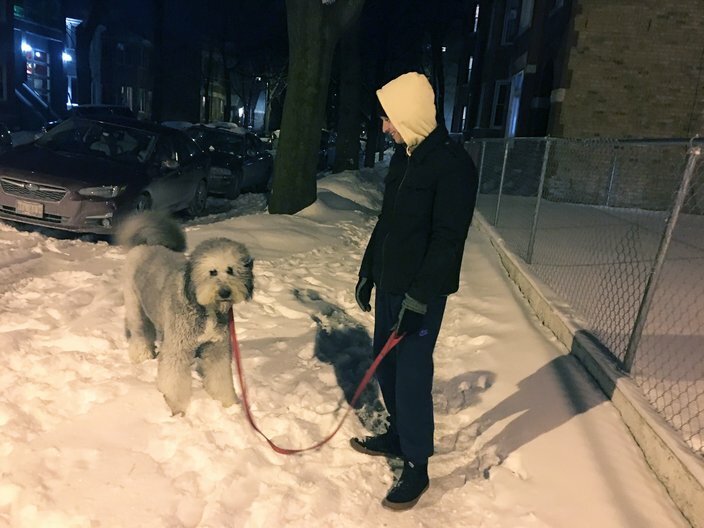 At the same time, it was 29 below in Minnesota, and 19 below in Chicago, with a wind chill of 57 below reported in northern Illinois. It was so cold the mail didn't go through. More than 1,600 flights were canceled at Chicago airports. Frostbite is a concern after just 10 minutes outdoors. 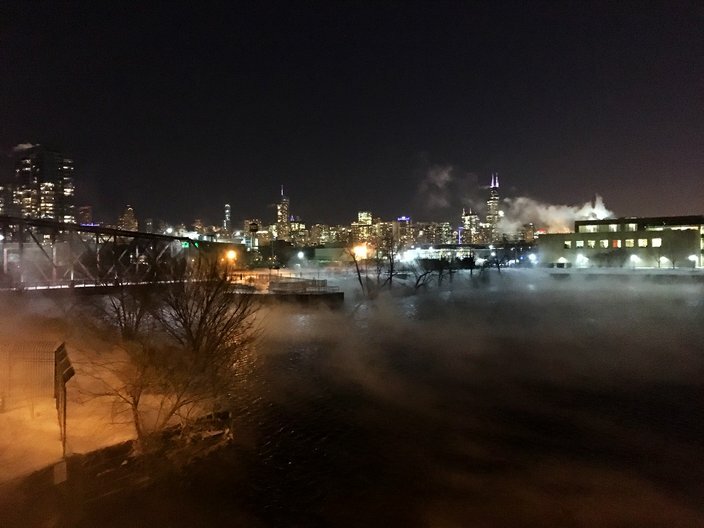 Water vapor rises from the Chicago River as the city hunkered down with temperatures Wednesday evening at minus 15 degrees. 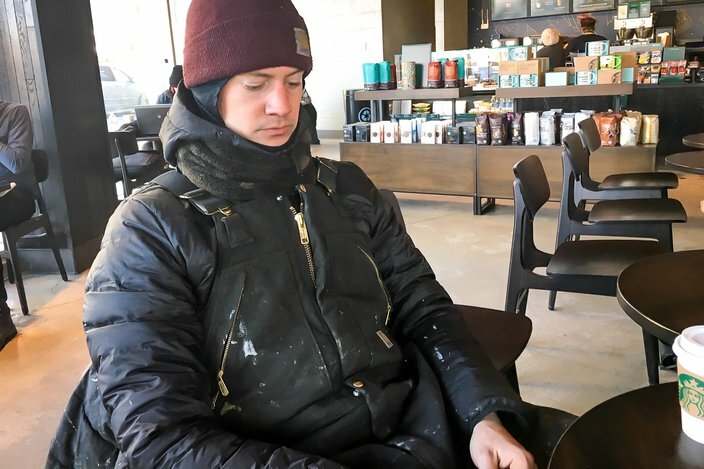 Liam McWilliams and his paint crew spent six hours a day out in the Chicago polar vortex to hand paint a wall for a travel advertisement. 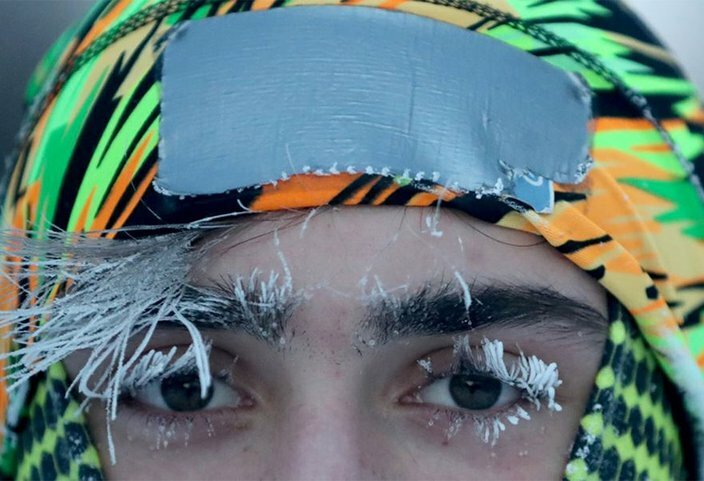 His employer, New York-based Colossal Media, told the crew “it was our discretion if we wanted to be out here but we wanted the challenge.” McWilliams, originally from Delaware and an Eagles fan, took this selfie after ice formed on his eyelashes. 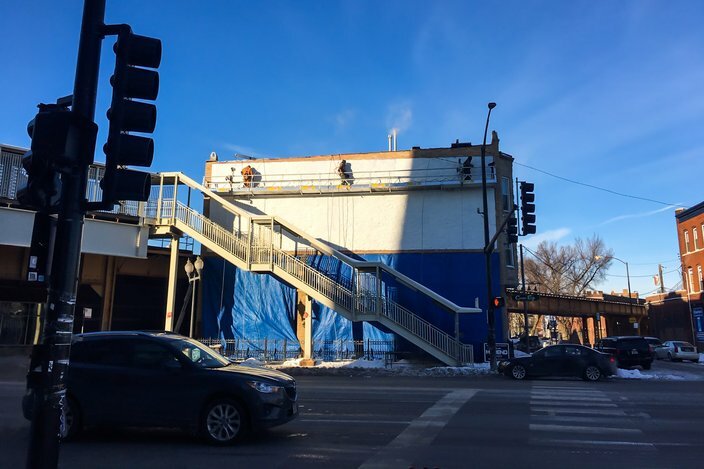 McWilliams and the rest of the paint crew were out early Wednesday and Thursday, during the brunt of the historic Arctic cold blast in Chicago, to prepare a building wall for a new hand painted advertisement. 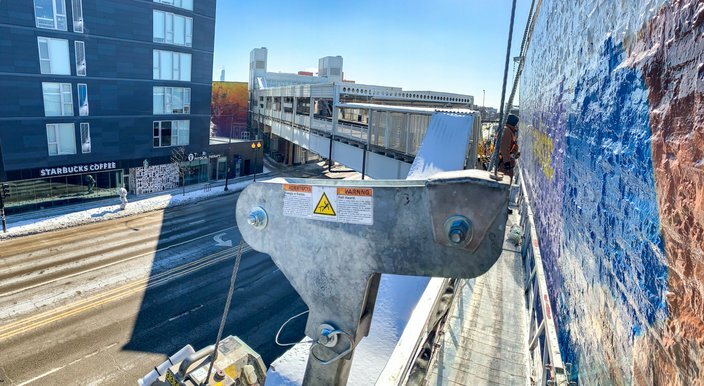 The scene from the scaffold as the crew battled the Chicago polar vortex cold Wednesday and Thursday. 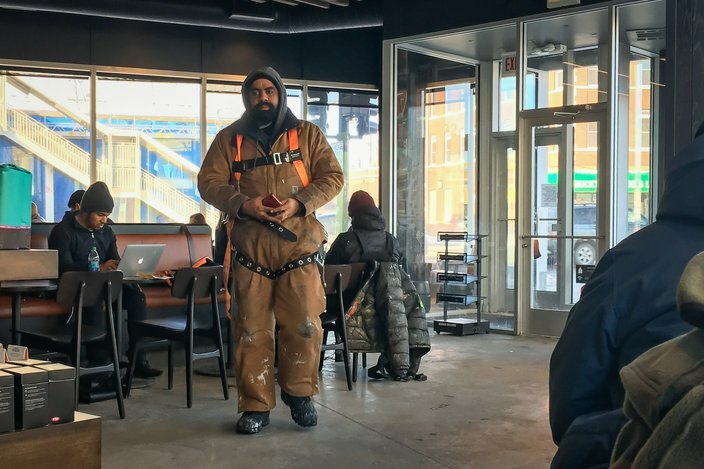 At the time, it was around 19 degrees below zero with a windchill around 30 below. Member of the Colossal Media paint crew getting ready to return to the grim Chicago weather. 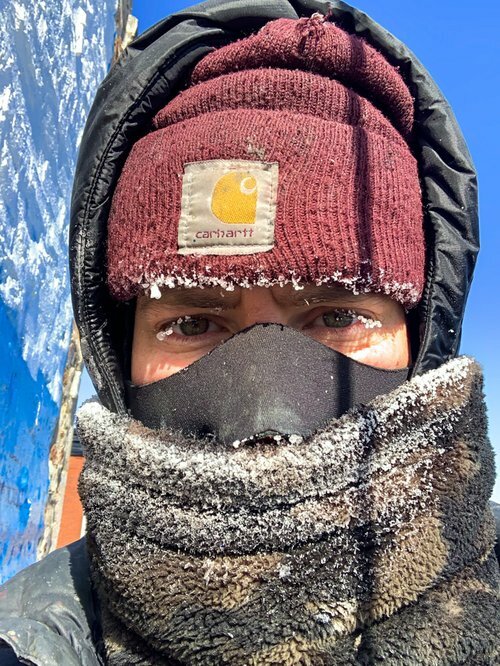 University of Minnesota student Daniel Dylla was frosted in the morning cold while pausing from a jog along the Mississippi River on Jan. 29, 2019 in Minneapolis, Minn.
“They're going to call me 'wife of the frozen pants guy' in my obituary,” joked Karla Grotting on Jan. 29, 2019, when asked about her husband Tom's annual tradition of freezing clothing for their yard in Northeast Minneapolis, Minn. Tom even has a tutorial for how to make them on his instagram page @tomgrotting. 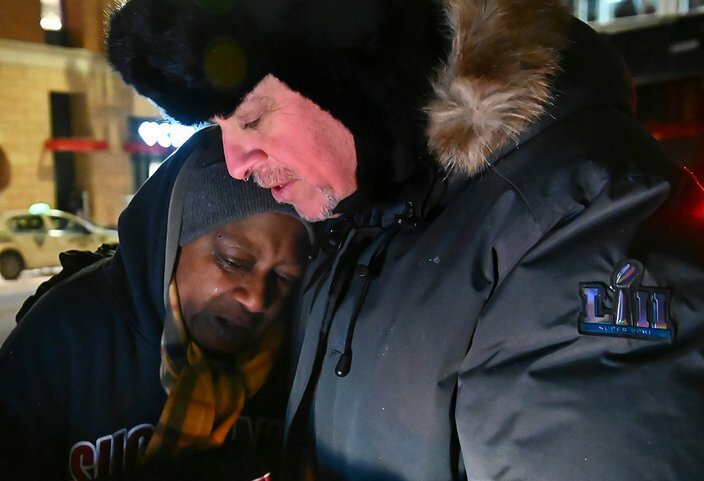 Pastor John Steger, with Grace In The City church, embraces Jearline Cyrus, a homeless woman, in downtown Minneapolis on Tuesday night, Jan. 29, 2019, while delivering cold-weather gear, hot chocolate and food with Minneapolis police Sgt. Grant Snyder. 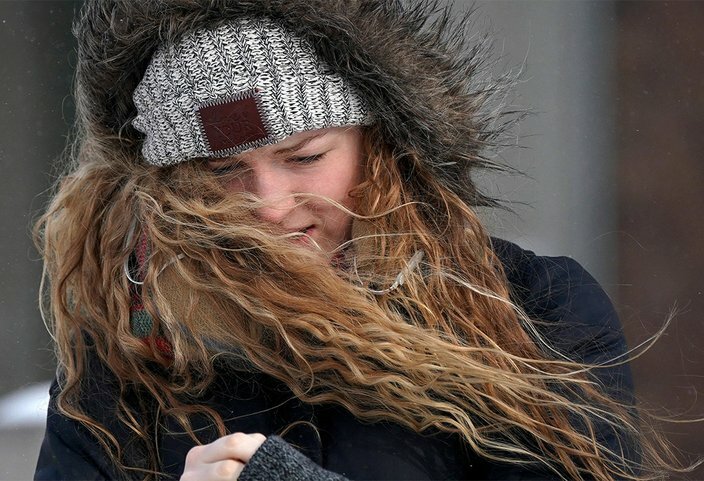 Katie Benedict, a freshman at the University of Minnesota studying biology, fights against the wind as she walks on campus on Tuesday, Jan. 29, 2019 in Minneapolis, Minn. Minnesotans layered up as temperatures and wind chills stayed well below 0 degrees Fahrenheit. 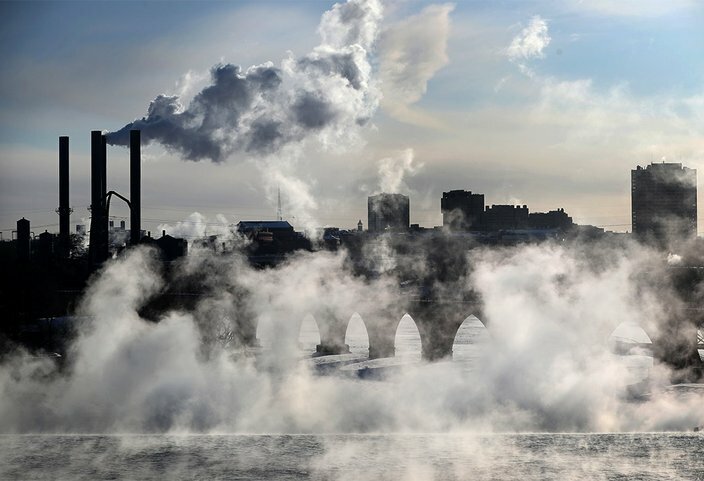 Water vapor rises above St. Anthony Falls on the Mississippi River as the Stone Arch Brige is obscured, seen from the Third Avenue Bridge on Tuesday, Jan. 29, 2019, In Minneapolis, Minn.
Jillian Hansen, a senior at the University of Minnesota studying political science, walks on campus wrapped up in an oversized scarf as snow flurries floated in the air on Tuesday, Jan. 29, 2019 in Minneapolis, Minn.
Minneapolis police Sgt. 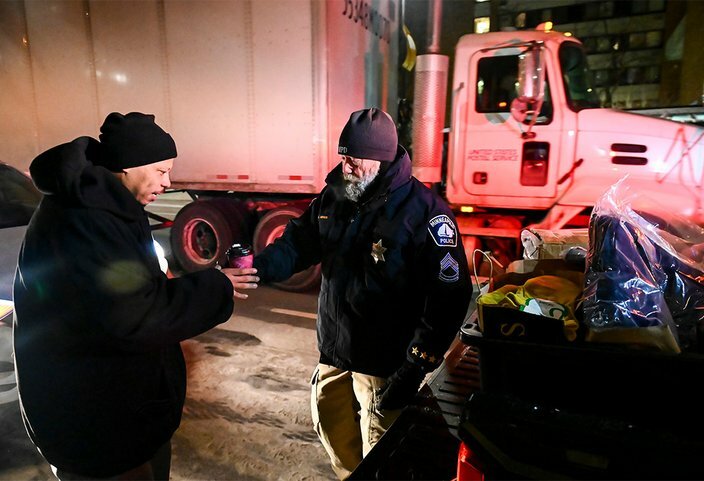 Grant Snyder hands a cup of hot chocolate to Dawone Boclair outside the public library on Hennepin Avenue in downtown Minneapolis as the temperatures dipped to -20 degrees Fahrenheit on Tuesday night, Jan. 29, 2019. 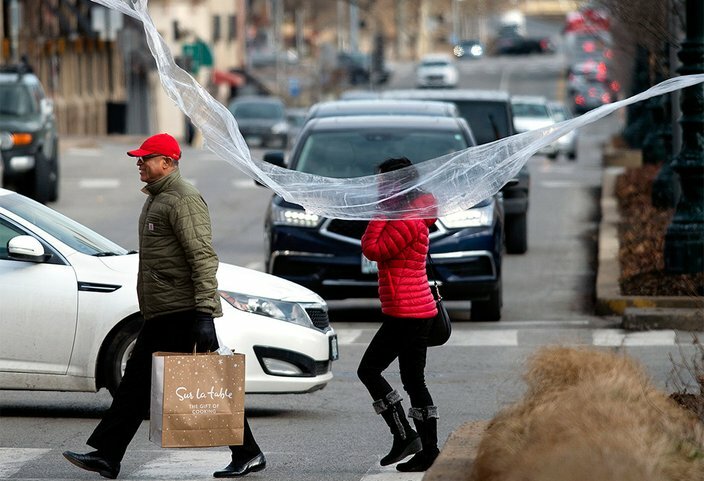 A piece of plastic clinging to a signpost was whipped in the air by strong winds on Monday, Jan. 28, 2019, at 47th Street and Broadway Boulevard on the Country Club Plaza in Kansas City, Mo.